General of the Army (GA) is a military rank used (primarily in the United States of America) to denote a senior military leader, usually a general in command of a nation's army. It may also be the title given to a general who commands an army in the field. The rank is typically considered the equivalent of marshal, field marshal, fleet admiral and other equivalent five-star ranks. 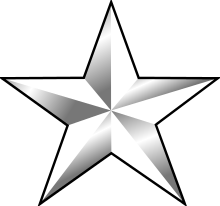 The rank of "General of the Army" should not be confused with the title "army general"; the rank of "General of the Army" is usually the equivalent of a five-star rank, and theoretically corresponds to overall command of an entire national army, whereas the title of "army general" is usually held by the equivalent of a four-star general, and corresponds to the command of an individual army in the field. The highest army rank in Liberia is "five-star" General of the Army (or field marshal). The rank is held by the Liberian President and Commander-in-Chief and was first used by Samuel Doe (1951–1990) who promoted himself from master sergeant to the rank after seizing control of the nation. The insignia of grade was worn as five stars in a row on the collar and a circle of five stars on headgear. The rank was later worn as a circle of five gold stars on the collar by President Charles Taylor (b.1948). The senior professional military rank in the Liberian army is now usually a "two-star" officer. ↑ "Army Regutation 600-20 see table 1-1" (PDF).